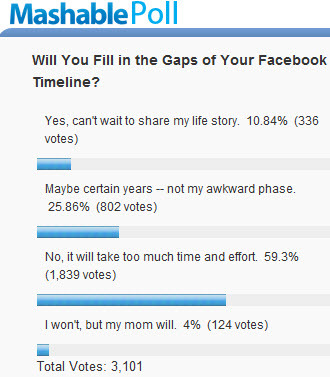 I followed this Poll on Mashable that asked if people planned to go back to fill in the gaps of their Facebook timeline. There were 3,101 votes at the time of this posting with ~11% stating they will and ~60% saying they won’t. I find that 11% to be a pretty small number and surely not one that would make Facebook happy about the rollout. Sure it’s a relatively small sample size, and Mashable users may not equate to a mainstream Facebook user, but I think this number will be pretty close to reality. You can also argue that polling whether users will go back to update versus whether they will configure their timeline moving forward are two separate questions, I believe the answer will be about the same. I think the majority of users on Facebook will not like this transition as they mainly use the service to communicate and share information with their friends in a simple clean interface and timeline will now become an obstacle to that. I also felt the timeline should have been a supplemental view instead of a profile replacement and if only 11% of users embrace it, then it will most likely fail miserably. It’s a distinct departure from both the current utility and UI of the service. I went through my timeline and there are huge gaps and the primary reason for that is that I don’t use Facebook as the hub of my Lifestream. Most of my content was posted on other services. Most of photos were posted on Flickr, my status updates on Twitter, my videos on YouTube…etc. Unless you’ve been using Facebook as the central repository for all of your social sharing, or plan to do so moving forward, then it doesn’t quite make sense to be your Lifestream’s home base. This blog was created because I was researching tools that gave me the freedom to aggregate the content I created to create a Lifestream across various different services I wanted to use. I think many people enjoy that freedom and don’t want to be confined to the limitations of a single service and its limitations to do this. Facebook does appear to have built in the hooks to offer us the ability to cobble together a few custom apps that we will be able to place on our timelines (such as the spotify app) to provide a way for 3rd party services to power our Lifestream on Facebook. However I’ve also stated in the past that mainstream users won’t go down this path and Facebook could presumably become a Lifestream for them. With the rollout of timelines we shall soon see what mainstream users think of it and whether it will resonate with them. I suspect that the average user would be LESS likely than the Mashable reader to go back and fill in the gaps in his/her timeline – which means that the actual percentage of Facebook users with complete timelines could be much less than 11%. Presumably Facebook will try to induce us to complete our timelines, but it’s going to be a difficult task. Even if Facebook DOES integrate with other services, and even if Facebook has the capability to go into old Usenet archives (which happen to be accessible via Facebook competitor Google), my personal timeline is only going to be 60% complete at best. Let’s face it, I wasn’t creating a lot of online content in the 1970s, much less the 1960s. I’ll admit that I haven’t implemented a timeline yet (I didn’t want to go through all the “developer” stuff), but aren’t these timelines all going to appear pretty empty as you go back in time? Nice post its really very informative post i think its helpful for all the visitors of this blog. The greater part of clients on Facebook won’t care for this move as they essentially utilize the administration to convey and impart data to their companions in a straightforward clean interface and timetable will now turn into a deterrent to that. Utilizing Facebook as the focal archive for the majority of your social sharing, or plan to do as such pushing ahead, then it doesn’t exactly bode well to be your Life stream’s home base. Facebook appears to have worked in the snares to offer us the capacity to cobble together a couple of custom applications that we will have the capacity to put on our timetables to give an approach to outsider administrations to control our Life stream on Facebook.